Kyle Larson scored his first short track win Saturday night. It was drama on the final lap and drama for others hoping to make NASCAR’s playoffs. 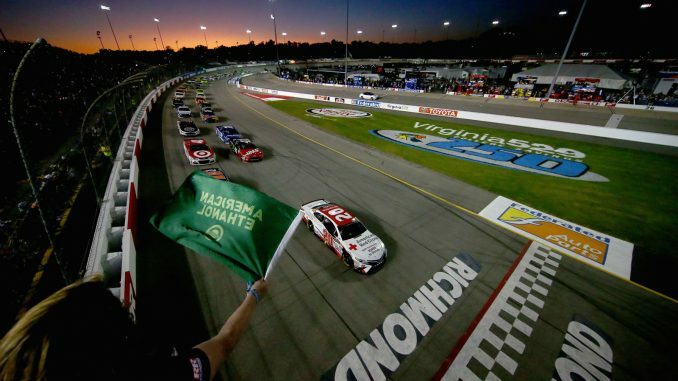 Here’s how it all went down at Richmond Raceway Saturday night. From his second pole of the season (his first came at Richmond in the spring), Matt Kenseth led the field to the green for the final regular season race; defending race winner Denny Hamlin started second. Kurt Busch, Kyle Larson and Martin Truex Jr. made up the top five. No one was sent to the rear. Kenseth had the lead into turn 1; Hamlin moved behind into second. Larson and Kurt Busch dueled for third with Larson getting the spot by lap 3. Kyle Busch was looking for fifth from Truex. Truex was able to hold his spot. Kurt Busch settled into sixth just ahead of his younger brother. The lead was just .6 of a second by lap 10. Kenseth had caught the back of the field by lap 18. Truex had third by lap 26. The lead for Kenseth was 1.7 seconds. Landon Cassill crashed into the turn 1 wall on lap 35 right in front of leader Kenneth, and the first caution of the night came out. The leaders all pitted. Kenseth was out first followed by Kurt Busch, Truex, Kevin Harvick, and Kyle Busch. Green came out to start lap 41. Kenseth took the lead but it was three wide behind for second; Truex emerged with the spot, Kyle Busch third, Larson fourth, Kurt Busch fifth. Harvick had dropped to eighth. Hamlin also dropped and was outside the top 10 by lap 45 after restarting sixth. The lead for Kenseth was just over a second by lap 51. Chase Elliott took fifth from Kurt Busch on lap 54. 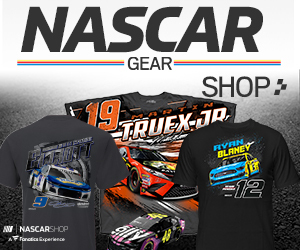 Truex was starting to catch leader Kenseth as the end of the first stage was coming to the a close. Caution 2 came out on lap 88, just as Kenseth locked up his breaks and sent smoke out; NASCAR threw the caution when the saw the smoke. Despite only 12 laps to the end of the stage, the leaders pitted. Kenseth was out first followed by Kyle Busch, Truex, Larson and Ryan Blaney. The cars gambled and stayed out; Bard Keselowski, Ricky Stenhouse Jr. and Paul Menard, Kenseth restreet fourth on lap 93; Kyle Busch shot to the lead after a four-wide battle; Larson slid into second. With five to go, Larson was looking for the lead and the stage win. Clint Bowyer was third, Kenseth fourth, Truex fifth. Top 10 Stage 1: Kyle Busch, Larson, Bowyer, Kenseth, Truex, Joey Logano, Erik Jones, Jamie McMurray, and Kurt Busch. The leaders pitted. Kyle Busch was out first followed by Larson, Kenseth, Bowyer and Logano. Bowyer was penalized was his crew going over the wall too soon; he was sent to the rear of the field and restarted 34th. Ryan Newman stayed out and had the lead when the green came out to start stage 2 on lap 110. Kyle Busch easily had the lead; Larson grabbed second, Kenseth third. Larson took the lead just as the field started lap 112. After starting 21st, Dale Earnhardt Jr. was looking for eighth by lap 114. Truex took fourth on lap 119. Busch retook the lead on lap 130. Kenseth took second on lap 132. Truex was fourth, Logano fifth. Truex took third on lap 138. The lead was just a half a second. Truex took second on lap 151. He took the lead on lap 154. Kenseth retook second on lap 165. The lead for Truex was just over a second. Larson took third on lap 177. Erik Jones had fourth by lap 186; Logano was holding onto fifth as Keselowski lurked. Earnhardt Jr. was seventh. Logano was looking for fourth from Larson just after Jones got by for third on lap 190. Logano had fourth with 10 to go in the stage. Keselowski took fifth on with five laps to go in the stage. Earnhardt Jr. was looking for sixth with 3 to go in the stage. Caution four came out to end the stage. Top 10 Stage 2: Truex, Kenseth, Jones, Logano, Keselowski, Larson, Earnhardt, Kurt Busch, Newman, and Kyle Busch. The leaders pitted. Truex was out first, followed by Kenseth, Logano, Larson and Keselowski. Bowyer came out 10th after rallying from his penalty. Jones lost three spots with a lug nut issue. Harvick restarted 23rd after sustaining damage from a brake rotor. The green came out to start lap 210; Truex took the lead as Larson took second, Jones rocketed to third. Kurt Busch was fourth, Kenseth fifth. Keselowski took fifth on lap 218. Logano took sixth from Kenseth on lap 221. Keselowski took fourth on lap 223. Kenseth continued to fall and was eighth by lap 235. Keselowski took third on lap 246. Kurt Busch took fourth on lap 251. The lead for Truex was nearing two seconds. Danica Patrick spun in turn 1 after contact from Austin Dillon and caution five came out on lap 255. Neither had any damage and both continued. The leaders pitted. Larson was out first followed by Keselowski, Kurt Busch, Truex and Jones. The hood went up on Kenseth’s car with damage. It occurred when the field slowed when an ambulance stopped just before the entrance to pit road, and the field bunched up; the team took the car behind the wall for repairs. Bowyer also had to get repairs; he had made contact with Kenseth. Green came out to start lap 263; Larson and Keselowski were side by side for the lead, with Larson getting the edge a lap later. Kurt Busch was soon looking for second and was side by side for second; Truex lurked just behind. Keselowski had second by lap 268. NASCAR reported there would be no penalties for a commitment line violation due to the ambulance. Kenseth’s crew reported that his car was done for the night. Truex took second on lap 278. He was soon catching the leader; he took the top spot on lap 287. Earnhardt had worked his way to sixth by lap 309. The lead for Truex was just over 2 seconds by lap 315. Earnhardt took fifth on lap 317, as deeper in the field green flag stops began. Logano pitted from eighth on lap 321; Keselowski followed. Kurt Busch took second on lap 328. Kyle Busch, Erik Jones and other pitted on lap 333. Truex pitted on lap 335. Earnhardt stayed out hoping for a caution and had the led. Having pitted early, Keselowski with fresher tires was soon second and quickly catching Earnhardt. He got the lead on lap 348. Truex took second on lap 350, Larson third from Earnhardt a lap later. Truex was looking for the lead and got it on lap 355. Earnhardt finally pitted on lap 356. The lead for Truex was 2.5 seconds. Larson took second on lap 358. The top five with 39 to go: Truex, Larson, Keselowski, Kurt Busch and Jones. Earnhardt was a lap down in 22nd. Bowyer also hoping for a cation pitted late; then was penalized for an uncontrolled tire. With 20 to go the lead for Truex was growing, it was 3.47 seconds. There were 13 cars on the lead lap. Jones took fourth with five laps to go. He was the highest running car who needed a win to make the playoffs. Caution came out with four laps to go when Derrick Cope hit the wall. It setup a final round of stops, and an overtime finish. The leaders indeed pitted. Larson was able to get out first, Truex was second, followed by Kurt Busch, Keselowski and Jones. Larson took a clear lead; Hamlin trying to charge towards the front from eighth made contact with Truex entering turn 1 and Truex was sent into the wall; the race ended under caution with Larson the winner. Logano, needing a win to make the playoffs, had made a late dive towards the front but came up short coming home second. Ryan Newman was third, Kurt Busch fourth, Daniel Suarez fifth. Hamlin was sixth, Jones seventh, followed by Jimmie Johnson, Kyle Busch and Chase Elliott tenth. The Round of 16 for Chicago: Truex, Larson, Kyle Busch, Keselowski, Johnson, Kevin Harvick, Hamlin, Ricky Stenhouse Jr., Ryan Blaney, Elliott, Newman, Kurt Busch, Kasey Kahne, Austin Dillon, Kenseth, and Jamie McMurray. The first playoff race will be next Sunday at Chicagoland Speedway, at 3:00 p.m. ET.